Next up in the follow up of our Heritage Week event “Sharing Memories” is Michael and Margaret Mai Moloney. You can read more about the background to these oral history recordings, first made in 1992, here. Brother and sister, Michael and Margaret Mai were from Moloney’s Butchers on Main Street. Margaret Mai was born in 1904 and Michael was born in 1910. This means that they were also both in their 80’s at the time of the interviews. They both remember Killaloe as “a great place at the time”. Margaret Mai died shortly after being interviewed in 1992 and Michael passed away in 2005, aged 95. My grandfather was from Portumna and my father was from Ballina, my father was born in Ballina, I suppose, just above Ballina, a mile or so up in the countryside, they had a farm up there. My father and mother had a butcher’s shop, down where Chris Minogue is now. When he died we were young, she came up here and bought this house, when my father died we gave up the butchering after about two years, first of all she bought land abroad in the country, a small bit of land, 8 or 10 acres and we went out there to live, you see. So my brother Martin, he was young at the time, went to my uncles in Nenagh to Healy’s, he went to school there and all. 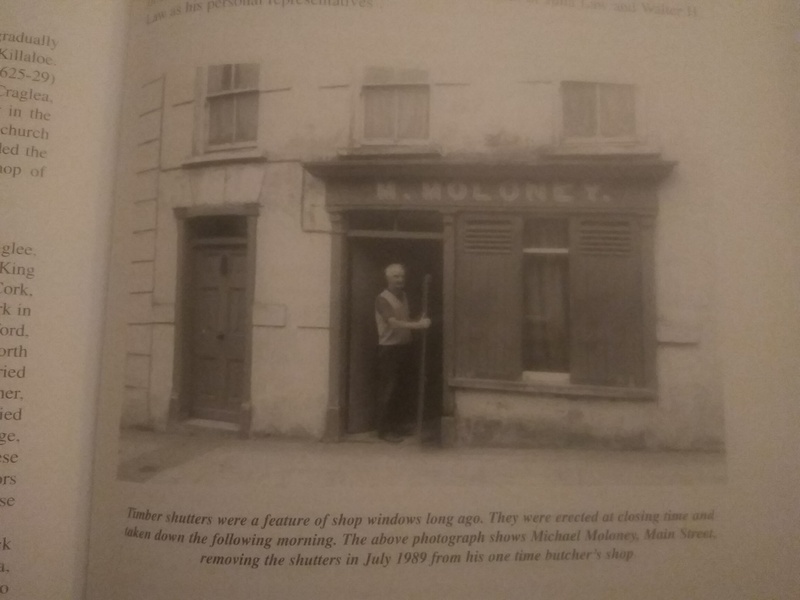 They had butcher stalls all their lives and he went there to learn the trade, when he came back he went to work with Willie Minogue and then after a time he started beyond in Ballina in Mc Keogh’s. He started butchering and we had a butcher stall here and one in Ballina and one in Killaloe, my mother was in the butchering all her life in Nenagh and we helped out. And a sister of mine …….. she was married to Tom Hayes, the contractor but she’s dead now. What can you remember about the Shannon from your younger days? At the Lakeside beyond there was gates going out across the Shannon, way there, across the Lake and they could regulate the water, you see and in my time going across the bridge, there was parts of that and there was only 2 ft. of water and 3 ft. of water, you could look down and see the salmon, the trout, the perch and the pike and the eels, all under you in the river, that was going down along to Magee’s Lock. The canal boats used to go in there, going from Dublin to Limerick you see, down about half a mile from that there was Crowe’s Lock you see, the Canal now at the Pier Head, the Shannon was divided, there was a Canal where the Canal boats used to come into, they used to come down under this bridge here below at the Anchor Bar and there was a Canal Store there you see, they had to unload all the stuff there, porter and everything. Then they’d continue on into Limerick, they’d go through Magee’s Lock and Crowe’s Lock, they’d pass down the Mill where all the stuff was being grinded. When they’d go out of Crowe’s Lock the Canal and the Shannon would join up again into the one river. In the olden times there was no Weir or Dam like there is today, but they’d go down through O’Briensbridge and down through Doonass and all these places, through the Locks and into Limerick. But then when they put the Weir across below in Parteen, they blocked the river you see, and they made a new Canal and the boats have to go through that now you see, down along and there is only a certain amount of water going down to Castleconnell and all those places. The fishing is nearly done away with down there now and sure the fishing is done away with here too, the salmon fishing. In my time now down at the bridge going across there was water there and there waspools in it and there’d be salmon fishing. You’d see salmon 30 lb and 35 lb weight. There were Grimes, they were fishermen, sure there were 20 fishermen here, the gentry used to come across from England that time for the salmon fishing alone, and when they’d hook a salmon there, they might be playing the salmon for an hour or half an hour around that space of water and you could be looking in at them. Oh Killaloe was a good spot that time, lovely, lovely. You had hotels, you had the Lakeside and Graces, do you know up the steps where Jack Ryan lives now, that was Graces hotel…. Minnie & Kathleen Grace ………. when the gentry would be coming they’d ring up and say they’d be comingand she would take a whole lamb from us, lamb or mutton, that was what she’d cook for them. When we’d come in from school, young ones at 3pm we’d go down to the steps it and Mr. Jeffrey and his wife would come out, he had a big balcony and he’d throw us bars of chocolate and sweets and everything. These fishermen then would hire 2 men in each boat with them for maybe 3 weeks or a month and they’d go out fishing with them all day. These used to take down the dinner to them. You said that they’d buy a whole lamb from you – could you remember how much a whole lamb would cost that time? A whole lamb that time would cost maybe 2/6d. a lb, that’s all. Then you had the Shannon View, a fine hotel with a bar and all. You know down there where the cars are parked now. They went and knocked it down…..what they shouldn’t have done at all. Why did they knock it? I don’t know. It was three storey’s high, even if they had taken one storey off it…it was a sound building but they knocked it anyway and they can’t build down there now. The Mill was going then and it had maybe with 15 or 16 men employed there. I wanted to ask you about the Mill and what went on there – did farmers bring in their corn to have it ground? There was a boat there The Faugh-a-Balla was its name, she used to go into Limerick and she’d bring out the corn, the yellow corn you know. I don’t know who owned the boat, I suppose the Board of Works. Was it based here in Killaloe? And how many men did you say were employed there? I’d say about 15 maybe, I wouldn’t rightly know but I’d say about that. And then you had Clarisford House, the Protestant Bishop lived in it, there’s no one in that now. Who was the Protestant Bishop? There was different ones there – there was a Bishop Perdue and a Bishop Stanistreet and all them, about 6 or 7 different Bishops there, in our time. There was a Protestant School down below there where you go in towards the Bishops, where the road is divided, there on your left. I don’t know but it was where all the Protestants went to school. There was a Mistress, Miss King was her name. That’s gone now. They were talking about building a library there but we didn’t hear anything about it since. You had the trains coming into Ballina and Killaloe, on a Sunday there there’d be three, maybe three excursion trains into it, and there’d be three or four thousand people on it, the long cars and the side cars. And then you had the Regatta in it, you’d say, and before the Regatta all the Limerick and mahi?? men, they’d come out maybe two or three days before that, and do you know the pier head down there? They’d be taking up their position there, their spaces, before the Regatta… pulling the tug-o-war, a big rope, and the slippery pole. Oh we used to have great times. A lot better than today? Oh what! Sure it’s a graveyard today, sure there’s nothing at all in it… There was a man here named Peter Noonan, the slippery pole he used to win it every year nearly…Oh, to see him going out along it and diving… ah t’was very good. Oh, Killaloe was a grand place then. And then they’d hire the boats, a man and a woman, and their children, and go off up….. The boats then, below the canal bank you had all the pleasure boats, rowing them up, and motorboats, when they’d come out of a Sunday there taking them up the lake… They used to pull in there at Brian Boru’s Fort and another place further up, a field where they used to pull in and have their lunch. Can you remember the names of the people who lived in the houses around, up and down the street, when you were young? Loughnanes were living in the drapers shop where the pool game is going on there now………. Mrs. Larkin; Flynns lived in the Public House down at the very corner, below where the Anchor Bar is. There were Kent’s where Mrs. Reddan is now in Bridge St. and there was a tailor Matt Mulcahy there opposite Andy Mc Grath’s, straight opposite that next to the Hairdressers. There were Gleeson’s where the Hairdresser is, I’d say, selling fishing tackle, selling daily papers and the Guardian and you’d get sweets and all there. Straight opposite that was a Mrs. Whelan, she used to have the Limerick crowd, when there was a Regatta she’d be giving teas and all that. Where Andy McGrath is living now, just below Crowe’s, up for the Seanachoí. Then we had our own Convent School below there on the Convent Hill, of course it’s all done up now and the Nuns there beside it. And the Dean of Killaloe living there opposite them, the Protestant Dean, Dean Perdue is in it now. There is no Protestant Bishop now, I don’t know who is in Clarisford, you wouldn’t be allowed in it at all. What was that like when ye were children? You wouldn’t be allowed go round it very much, but it was kept very well you see, all the big walled gardens and it was all trimmed and walks through it. It’s a wreck altogether now sure. Do you remember who worked there? There was a man named Tierney and he was a gardener there, in my time there was 4 or 5 men there. In years gone by there’d be alot more men working there, there was good employment in Killaloe that time. I worked in the Shannon Scheme in Forthenry, I was only a messenger boy collecting the pay, there was a Paymaster in it, Healy was his name and a man from Killaloe named Robinson. They’re all dead now. Where did they prepare the wages? Did they have an office? They had a big office down near the Weir, the dam there in Parteen. We had the band one time …. The Temperance Band, with a man training us. Do you know below where the eel weir is, there was a big hut, an ex-soldiers hut and down in the Band Hall there, you know where Harry Brann is now there, we had several different places. Did ye ever play at dances outside of Killaloe? Not at dances, at hurling’s and all that kind of a game. Did you ever hurl yourself? Deed I didn’t, but the brother used to … Martin, Lord of Mercy on him he hurled with “The Ballina’s “. We had a Boxing Club here at one time. Alot of them are dead now, the chaps that were in it. Is there anyone alive now that was in it? There’s a fellow named Paddy Casey, he got his leg off the other day, in Ballina, and there was a Madden boy but he’s in Clonlara. McInerney and Paddy Moore, there were in it but they’re dead now. I believe the boxing club was in Fr. Byrnes’s house – is that right? We were there for a while, we used to be there training. Down in the Band Hall we used to be, mostly. Who trained ye? Who was over ye? There was a man named Curry, he was a Garda stationed here, he used to be over us. Do you know where Molua is – that used to be the Old Barrack, the Old Police Barrack. Before they took it down, they marked every stone within it, you see, and then they took it down and brought it over onto the Aillerue and they brought it up here, and it was put up the very same as before it was taken down. They brought it by donkey and cart…? I did, I brought it up in a horse and cart. Were you paid for it? Who organised it, to have it done? There was a man named Dowdall over it all, anyway. The Board of Works, I think it was the Board of Works anyway. And why did they decide to move it? Were they frightened it was going to be washed away or something? Ah sure it would have been covered up with the water you see. That was before the place was, before the dam was put across the river. You see, when they put the damn across the river, the water came back and covered hundreds upon hundreds of acres of ground down between this and the weir where the dam is. From the bridge, from the Killaloe bridge down now to the weir, there was a couple of thousand acres covered. You see they put a big dam down through the pollocks, and that stopped the water, and the water took its level then as it was coming back, and went in on all the land that was. And that place, I suppose there’d be forty feet of water over it, where that church was now on that island there. The fishing was great, oh the lovely gentry used to come to fish, you love to see it, lovely, lovely……. Down below where the Canal Bank we’ll say, there would be at least 40 or so rowing boats there of a Sunday and they’d be all out on the lake, they’d be all out, a lot from Limerick would be out on the lake. There was a man there now named Tommy Grimes, his wife died there a month ago, Nellie, did you know her? Well he had motor boats and he would take people up the lake maybe 9 or 10 people at the time and they’d pay him so much, the money was no object. He might make maybe 10 or 15 trips in the day up the Lake and they all pay him so much. Did any local people ever would work in the hotels? Oh they did, the Noonan’s, there was a sister of Mrs. Coonan’s worked there yeah. Did the local people ever go into the hotels? Oh they did, in the night time they’d go in and have a drink yeah, and if they had friends they’d take them over there to the Lakeside. There was fishermen here and they’d go in with the gentry, there was Grimes’s here they were fishermen, Tom Grimes, Jackie Grimes and Paddy Grimes and there were Ives’s here, Bill Ives and they were fishermen too there were Lyons here too and they were fishermen, and any amount of them. They made their living from fishing? Most of them made their living from fishing. Then there were Lewis’s out in Newtown, eel fishing and setting lines for eels, they made their living at that too. And they used to be catching the badgers and getting so much for them. Where would they get the badgers? Out around the country – they were doing harm at that time. And what would they do with them? They’d skin them and send away the skin and get so much for the skin. And foxes and otters, they’d used to trap otters too, for otter skin coats. There was a man named Lucas, Wille Lucas and he was fishing and trapping otters and all at that time and many’s the time my brother would skin an otter for him and he’d send it away to England, he used to get, I think he used to get £2.50 for them that time. There was no dole that time, you know, everyone one was working, everyone. The women would work go in and work in the Hotels half day and all that and in the night when the husband would come from work they’d go over if there was dances setting the tables and that. There was work then but sure there wasn’t half the population there is now. Sure look at all the new houses that’s in it now. I wouldn’t know half that’s in it now. By God, I’m living in it and I couldn’t tell you 10 young fellas it in now. There’s a place there, they called it the Moon Gate, they used always say it was haunted, they used to say there was someone seen there. We never see anyone at it. At the Pier Head, they used to make out that there was people seen around there as well. There was a lot of drownings there? Oh there was, indeed there was, there were two Riordan girls drowned there one time. When the gates were across there, there was a sweep of water there into the gates and they came down in a rowing boat and Mr. Atty Parker was out where ever he was and he was shouting because they were coming in too near the gates you see and he was shouting at them to go back and go back, they were in danger and the next thing they were swept into the gates and the two of them were drowned, two Riordan’s from Ryninch. There were 5 young fellows drowned off the gate, they were swinging on it and the gate fell off and they were drowned too. Another man named Murphy, he lived here the time of the Shannon Scheme but we lived abroad in the country the first place we bought you see, and he used to go up and down our yard maybe even about 20 men or more would cross our yard they would be going down to work on the Shannon Scheme and they’d cross in a boat over to Forthenry shore; but we had an apple tree down below you see, and there was always a lot of apples on it and when they’d be going up and down they’d get some apples. Well anyway this Murphy man got some apples this day and be God when they were going across he was drowned and when he was found there were apples in his pocket, oh God it was sad. So when did ye move in here, in to the street? I don’t know, we are a long time here in the street, maybe 30 or 40 years I can’t say, I don’t know, but my brother had a stall over where Gerard McKeogh is and he used to take over the meat out of here. Do you know where the Funeral Parlour is? Well we owned that, it used to be our slaughter house, we’d kill the meat there. What would you pay for a beast in those days? Oh God, I suppose about £20 or that way, for a 2 year old heifer. I suppose at the present moment you’d probably pay £500 or more. So looking back on Killaloe from your young days and looking at it now….. Looking at it now, ‘tis only a graveyard compared to when we were young. What do you think would improve the town now? Plenty of work and factories, sure there’s factories and they’re only half going. That time you had a couple of dance halls in it, you’d a picture hall in it, a boxing club, billiards, snooker, and other games; there’s nothing now. Now they have to go to the Lakeside for a bit of amusement. The Cinema hall, you had pictures in it three nights a week, there’s nare a picture in it now. You had a Dance Hall below and the Guards used to have their dances in it, the Guards night dance. The Band Hall below, there’d be dances below of a Sunday, that time they’d be going all day. You had Hynes Buses, the first bus to ever come on the road here they’d be going in and out all day. A lovely band from Nenagh would come on a Sunday and the The Boher Buí band from Limerick and a couple of bands used to play at the dances on a Sunday night. And the day of a Regatta when the trains would come in they’d be over to meet them and they’d march back across the bridge, well it would be the same as a funeral now. If you wanted to go across to Ballina you could hardly go through them, the crowd would be so thick on the bridge. You could come out from Limerick for a couple of shillings we’ll say, that was the train fare. They’d always come in about 2 o’clock and they’d be there until 9 o’clock in the night singing and dancing in the pubs and all and up the lake and then they’d go back at 9 o’clock over to the train. There’d be always 9 or 10 of them late for the train and they’d come back singing then across the bridge and they didn’t care if they never got home. They’d be out for the night. You had side cars then, you might have 10 or 12 side cars. A horse with a car for four people, 2 on one side and two on the other side and the driver up the front of it driving and a fella with his two feet hanging down and he playing the majolin maybe. And nothing ever happened them. You had the long car then would carry about 10 or 12 people, you see. They’d sit in facing each other, 10 or 12 in the long car. All around the whole place all day and ice-cream cars and all there. Would the local people ever join in with them? Oh God they would, they would! All below watching them at the bridge and singing and dancing below there, dancing where the Shannon View is, on the roads at night before they’d go back over to the train. Was there ever any trouble with the Guards? Ah very little. They might meet a fellow drunk and put him in for the night.